Reading through Proverbs lately I noticed, as if for the first time, the preponderance of women. They are everywhere among the words of wisdom. There is Lady Wisdom, the great personification, and the lesser Folly. We meet wives, mothers, an adulteress and the woman of valor among many other women offering instruction to all who would listen. I could imagine a reader nearly missing the wisdom for all the women, missing the forest for the many and varied trees. The book of Proverbs is unique in this way, the presence of women front and center. Few other books in the Hebrew Bible feature women, allowing them to move from background to center stage quite like this collection. Maybe their place in the spotlight has something to do with troubled times. This collection came together, after all, amid the critical rise of the monarchy and the later collapse of it. When the nation of ancient Israel underwent periods of crisis true wisdom was found, not in the royal courts or among the priesthood, but round the table eating your wife’s food or under your mother’s roof. Wisdom was cultivated in that space where women were present and had much to offer when it came to thoughtful reflection on the practices for good living. But that isn’t the only connection between women and wisdom in Proverbs. While the presence of women matter, and their words of insight and instruction add strength to the content of the collection, their company does something else – something more provocative. The women of the community become the context where wisdom is measured. As more than one scholar has noted, one thing the prominence of women in Proverbs indicates is that the way we interact with various women in our community reveals the true depth and nature of our wisdom. I think about the African American mothers who mourn in our streets, demanding justice for their sons. I think about the grandmothers, too, who grieve the loss of their grandsons to racism generations old and going nowhere fast. These women in their loss and lament, in their protest and activism offer us insight if we are wise enough to listen. The women of these communities witness to hard truths, sobering realities and invite us into conversations about justice and humanity. I think about women who’ve braved the glare of public opinion and ridicule to talk about harassment in the halls of congress, in the armed services and other places of business. I think about the women who go to work and endure indignity at the hands of their male colleagues, and the ones who suffer abuse in the privacy of their own homes. For them being a woman in this world is to live vulnerable, to live bruised and susceptible to shame. Their presence in our neighborhood confronts us all. Will we walk in solidarity with these women? How far will we go to protect their dignity, their bodies, their livelihoods and lives? As we interact with these women we must engage these brutal questions. I think about the gifted sisters and saints of the church, those who walk in Miriam’s footsteps. Women compelled into seminary for deeper study, women called to minister the sacraments to the Body of Christ who hear that there is a glass ceiling when it comes to their service among us, despite their giftings and God-given skills. I consider the priests and pastors who stand in the pulpit and preach God’s Word to the congregation even as people stand and leave, refusing bread from a woman. And yet these very women who minister among us are a sign that God’s Kingdom has come, women who prophesy and testify to good news as the prophets foretold. They stand in our midst not as tokens, but icons to the Spirit at work. Do we have eyes to see and ears to hear? I believe Proverbs asks us to consider how we interact with the women in our communities. Do we listen to them? Do we offer daily respect and honor? Do we see their gifts and recognize their contributions? If we do, then we embody the wisdom of Proverbs. If we don’t, then we are the fool. So pay attention to how you respond to the women around you everyday – the ones in your workplace, across the dinner table, even the ones you see at church or on the television screen. If your inclination is to listen, to hear their stories as true and their pain as real then you might be on the path of wisdom. If you find yourself learning from the women around you, you might be on the path of wisdom. If women function as a prophetic voice offering you a way forward or some kind of clarity amid the confusion – you’re in good company on the path of wisdom. In troubling times like these we need wisdom, we need to see the forest. But without the presence of the mighty trees there would be no forest at all. 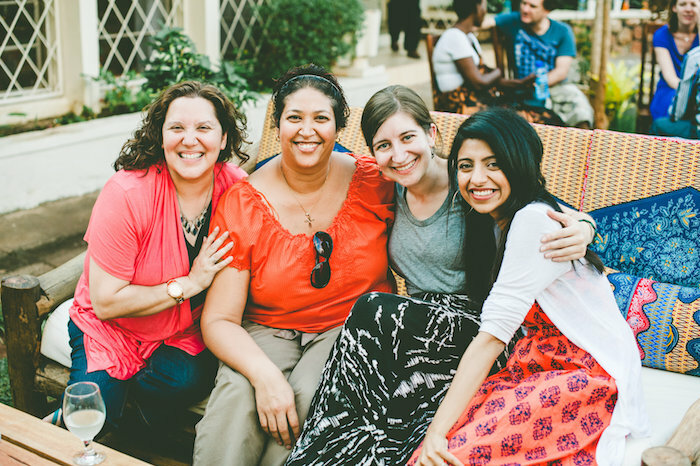 So let’s notice the women around us because they are our partners on the road to wisdom and wholeness. And how we interact with them is the true measure of our own wisdom, according to Proverbs.